This past weekend I attended SQL Saturday #233 in Washington DC. I presented a session this year titled “Backup and Recovery Fundamentals.” There was a great turn out of the session, with the room filled. Although there were some technical issues at the start but I got great support from the volunteers there. The feedback from the session was excellent, which means people learned and my goal was achieved. As for myself, I attended three sessions that day and I learned a lot more than just technical information. Humility – Arrogance in my humble opinion is one of the worst characteristics anyone can possess. Many people confuse it with confidence, but rather arrogance exceeds even over-confidence. It’s great for someone to have confidence, but there must be humility with it. The first session I attended was with Allan Hirt and was non-technical in nature. It felt like a “heart-to-heart” therapeutic session with a SQL Therapist. It put everything in perspective for me. 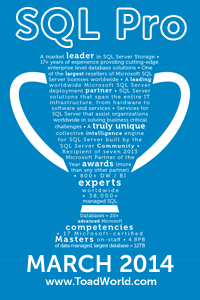 Allan is an MVP in Clustering which is very rare for a SQL Server professional. When you talk with him, he’s very down to earth and admits that he is not a walking encyclopedia and regularly needs to look things up. We all have to take a step back and realize that we are not perfect and then start to move forward in improving ourselves without looking down at others. When I was in the speaker’s lounge, I was surrounded by speakers with a ton more experience in both speaking and in SQL Server. I can honestly say that I was definitely the least qualified of all the speakers at the event. No body made me feel like that though. I had conversations with Steve Jones, Grant Fritchey, Tim Radney, Wayne Sheffield, David Klee, Brian Moran, Mike Walsh, Adam Belebczuk, Jason Brimhall and Allan Hirt; to name a few. There were tons of other well known SQL Server MVPs that I met there. Paying it Forward and Giving Back – One of the greatest things about PASS is all the free training. There are no strings attached when it comes to SQL Saturday, local chapter events and virtual chapter events. The training is free, it is provided by passionate professionals willing to give up their time to pay it forward. One of the best moments for me was during a discussion with Tim Radney in the speakers lounge. He was talking with myself and some of the other speakers and he mentioned how he was looking forward to giving the Backup and Recovery talk this year. Last year, I attended his talk and he gave me a free book on Backups and Recovery which I studied and then used to prepare for my presentation with the DBA Fundamentals Virtual Chapter (you can see the recording in the archives if you like). So Tim was saying how he looked through the list of presentations to see who was going to give the Backups talk since he was not selected and he was happy to see my name. It made him feel great that I took the knowledge he gave me and I am passing it on. This is the spirit of true learning and mastering of anything in life. Dedication – Everyone is dedicated from the volunteers to the attendees. Obviously the speakers and attendees are giving up their valuable time to both learn and give back to the community. The volunteers do a ton of work behind the scenes and are rarely recognized. I hope that everyone had the chance to thank the volunteers or consider volunteering at a future PASS SQL Saturday event; or any other PASS event for that matter. It’s a great way to learn, but it cannot be done without the hours of dedication put in by the organizers and volunteers. Great to connect, hope to cross paths again soon. Hopefully you weren’t stuck in the few inches of snow we got. Excellent post Ayman! Keep up the good work! Thank you again, Ayman, and I’m glad we’ll be seeing you around regularly! Thanks Matt. None of us could do anything without the awesome support volunteers like yourself give us. Thanks for your dedicated hours to the community! Great post about something we should all keep in mind. You’ve got a great attitude and I’m sorry I missed SQL Saturday this year and your session in particular. Thanks! There will always be more SQL Saturdays, hope to see you at a future venue. Nice write-up Ayman. It was nice meeting you and getting the chance to talk. Likewise! I added you to the list of people I met and updated Brian’s last name. Spell checker fail! Safe travels nice talking with you. For some reason bits and parts of this article disappeared and was unpublished. I’m guessing it had to do with the Android App for WordPress that I updated recently. My apologies for any confusion this may have caused. This should be fixed and this is the original article as published. Nice write-up Ayman. I’m glad that I got to meet you and talk with you a bit. See you around the speaking circuit! Likewise! Looking forward to seeing you in SQLSat Richmond. I already summited for the internals talk we discussed and hoping it gets approved. I’ll try to make a regular monthly meeting as well.